Did you ever need to attach your photo to a PDF form that you had to submit online? In the past, you probably had to use services of a professional photographer to get a high quality picture of a certain size. Then you would print out the form and glue the photo to it. After completing the form, you would either scan it or send a hard copy to wherever it needed to go. Besides needing a printer and a scanner, the whole process was just too time consuming and required some expenses. Now there is a far easier way to insert images into PDF documents. You can simply use PDFfiller! To get started, upload a document to your account, open it in the editor and select the Picture icon in the main toolbar to open the Image Wizard. You can either upload a picture that you already have or take a new one using your webcam. To upload an image from your computer, click the Upload button. Before inserting the image in the document, you can crop, rotate and flip it, change its background, and adjust its brightness and contrast. To insert the image into the document, just click on it in the Image Wizard. Move or resize it for a perfect fit using the mini toolbar. You can also take a picture using your webcam and add it to the document. Select a photo size to the right of your camera image, click Take, then click Use to proceed. The window that will open next allows you to crop the image, adjust its brightness and contrast, flip and rotate it, or enhance it otherwise. After you've finished editing your picture, click Save and Use to add it to your document immediately or select Save to use the picture later. You can easily remove the picture, just select it and click the trash can icon above. When you use PDFfiller to insert an image into a PDF document, you get the picture of the precise dimensions and you place it exactly where it should be attached. And even better, you save yourself a lot of time! If you like being able to insert images into PDF documents, you might be interested in a range of other great features that PDFfiller has to offer. Some of these include drawing, adding sticky notes, text boxes and fillable fields. Check out these tutorials to see the other great things that PDFfiller can do for you! How to Insert Images into PDFs? To insert images into PDFs, upload your documents using PDFfiller's uploader. Choose the 'Picture' button in the 'Edit' tab and open the 'Picture Manager'. You can capture photos or upload pictures to your online document. 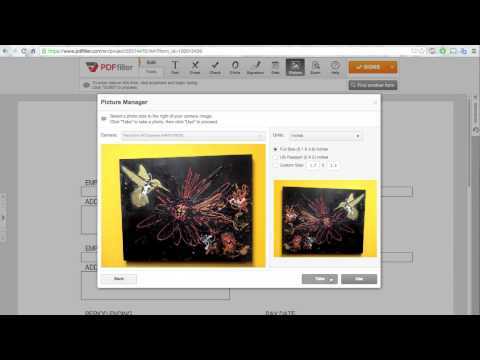 Drag and move the selected image anywhere in your PDF. You can change the size of the images using the adjustment bar. To insert an image of your signature into your PDF, Click the 'Signature' button and upload the signature to your document. To edit images in your PDF further, click the 'Tools' tab and highlight, blackout or erase pictures in your PDF documents. After inserting images into your PDF, click the 'Done' button and email, print or save your document. How to Insert Images into PDF Files online? PDFfiller is a web-based PDF editing tool which allows you to edit PDF text and images online. With PDFfiller, you can edit PDF documents by adding images or pictures online without downloading and installing any software. How to insert images into a PDF file online? To insert images into a PDF online, upload your document to PDFfiller's online editor and click the "Pictures" button in the "Edit" tab. Upload your saved image or capture it with your webcam and then upload it to the "Picture Manager". Then, select and insert the image into your desired location within your PDF. You can resize the image by dragging the corners. Can I add a photo to my PDF document? Yes. You can add any photo to your document online using PDFfiller. Upload your document to PDFfiller's online editor and click the "Pictures" button in the "Edit" tab. Upload your saved image or capture it with your webcam and then upload it to the "Picture Manager". Then, select and add the photo to your desired location within your PDF. You can resize the image by dragging the corners. How can I insert a profile picture into a PDF form Online? To insert a profile picture into a PDF, upload your document to PDFfiller's online editor and click the "Pictures" button in the "Edit" tab. Upload your saved image or capture it with your webcam and then upload it to the "Picture Manager". Then, select and insert the picture into your desired location within your PDF. You can resize the image by dragging the corners. How do I import an image to my online PDF document? To import an image to your online document, upload your document to PDFfiller's online editor and click the "Pictures" button in the "Edit" tab. Upload your saved image or capture it with your webcam and then upload it to the "Picture Manager". Then, select and insert the image into your desired location within your PDF. You can resize the image by dragging the corners.